Crescent City Sound Chorus - 2018-10-10 - Chorus news item: Crescent City Sound Chorus Fall Show! 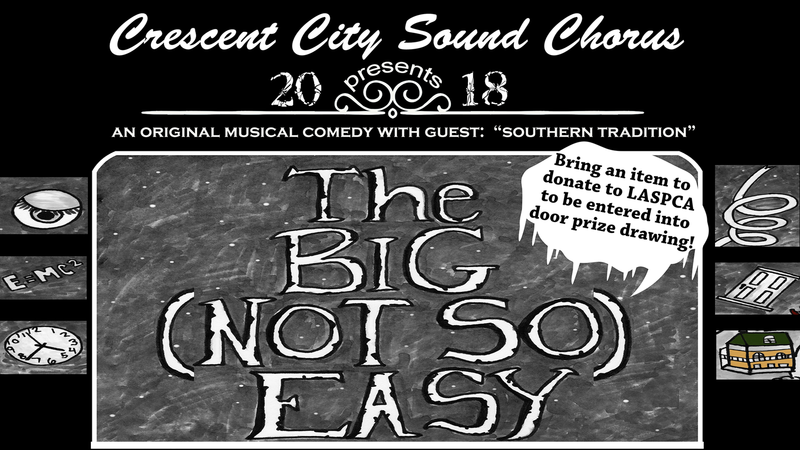 Crescent City Sound Chorus Fall Show! Join the Crescent City Sound Chorus for our fall show, a musical comedy with bizarre twists and turns, and of course, music! Special 15 minute "lagniappe" pre-show featuring music by quartets and more! Bring a monetary or item donation for LA-SPCA to be entered into the door prize raffle! Nims Fine Arts Center at Sacred Heart Academy, 4301 St. Charles Avenue. Tickets: $22, adults, $15, students and groups of 10+, children under 10 FREE!